Al Safadi is a well-known name for Arabic cuisine and it started its Umm Sequim outlet recently. This outlet is huge and spacious and you'll also find parking near it easily. it has outside seating as well as inside; and another interesting thing about the inside seating is that it has designated smoking and non-smoking area. So if you want to sit inside and do not like the smell of shisha, there is a designated zone for you. We started with the all-time favourite - the hummus. We ordered the hummus beiruty, which usually is the one with parsley and some spices. This one also had cumin in it, which was something new to me, and that brought about a peculiar flavour to it - a bit of an Indian flavour. Along with that they served fresh hot bread. This was brown bread unlike the usual white one. Also, the waiters would come intermittently with a basket of hot bread and would replace the old one on your table. A small gesture like this goes a long way to show about their hospitality. This place has an interesting take on one of the most common Indian snacks — chai paratha. 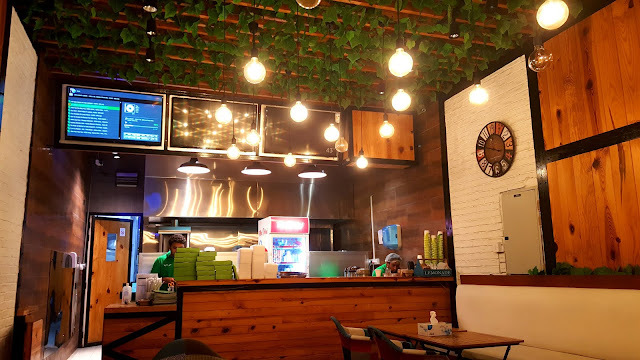 They have a huge variety of teas, ranging from the desi varieties to super-herb ones, and they've also got some really innovative ideas with the paratha. They have a couple of tables inside and a couple of them out. I went there at night and this restaurant was deserted. I was the only customer. It took a long time for the waiter to come and take my order - perhaps because they weren't expecting a customer and also couldn't see someone sitting, from inside the kitchen. Once the waiter was here, I ordered a dabeli cheese paratha and a vada pav. 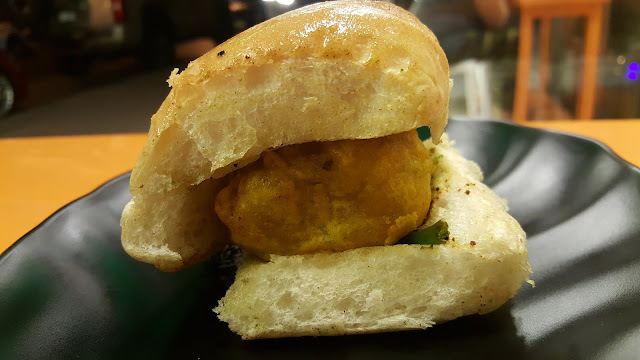 I was really hungry and thought I'd get the vada-pav soon and can start with it. But it came after the paratha. Bummer. The name is inspired from an are called 'Kemps Corner' in the city of Mumbai. It's got Maharashtrian cuisine, Goan cuisine, street food, other Indian food and Chinese too. I think the amount of variety they have makes it difficult for them to maintain the taste. Let me start with the good bit first. 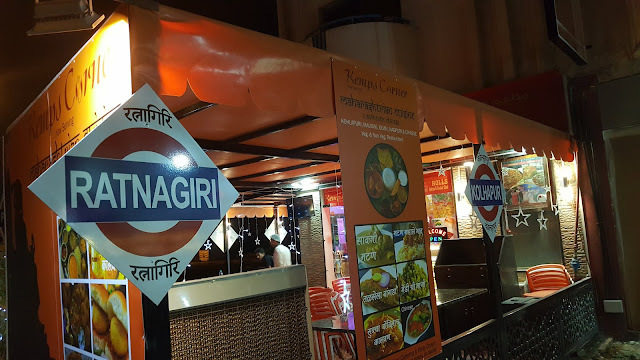 It's quite easy to locate even if you're slightly familiar with the area and it has boards like those of the Mumbai railway stations which are really catchy. We ordered a pulav with tomato saar(which can be loosely translated as a thin and spicy tomato soup). The pulav had a very nice aroma to it and tasted very good. It was a little yellowish in colour and the tomato saar complemented it well. We then had an anda bhurji which is a very popular street food. This one was good too. Well prepared and a bit spicy which is just the way it should be. 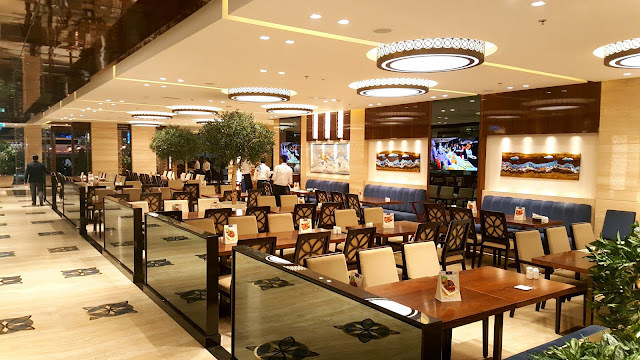 While searching for some 'tea' places, this one popped up and while I was pleasantly surprized to see over a dozen types of teas, they've also got some a lot of interesting food and that's what made me check this place out. They've got a big glittery green board which is easy to spot, but the place was a bit smaller than I expected. The interiors though are cozy, and the brown & green theme gives you the feel like you're in 'natural' surroundings. They've also got outside seating. We started off with a cup of karak saffron and a watermelon juice. The karak tea was good and so was the juice. Among the interesting items on their menu are the rigag and the khamir which are famous Arabic snacks. While the rigag is somewhat like a crepe, the khamir can be loosely translated to be a savoury pastry. They have a lot of options in that too choose from, and you can even mix 'n' match. For many of us, chicken wings are a comfort food. These days they are available with a lot of varieties and options, This place is no different. Before I get to the wings, let me start with a few other good things about the place. They have their own parking. It's free. And if you are unable to find a spot, there's free valet too. Wow. I never expected that from a place which is not a fine dine. We parked right outside the entrance. 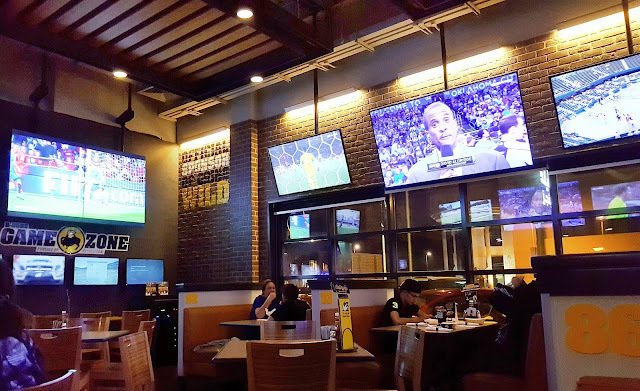 As soon as you enter, you can notice the ambiance is like a sports bar and has televisions with different sports playing all over. One one side are the normal chairs whereas the other side has bar-like high chairs. They staff greeted us and showed us to a table of our choice.